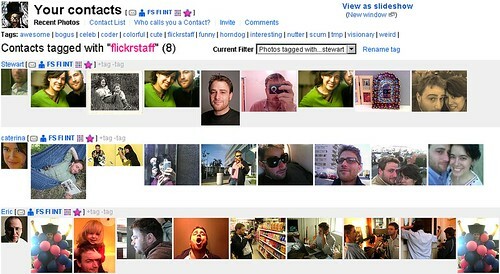 You can actually tag any flickr user they dont need to be your contacts in order for you to tag them. You can even tag users that have blocked you or you have blocked. The tags are stored locally on your machine and are thus private to you. To tag a user you can either do it from the contacts page, where a +tag link will be added next to users icons, or their recent photos, or theres also a “Tag this Person” menu item added to the "BuddyIcon" menus, which you can activate by hovering over a users Buddy Icon. Once youve tagged some contacts, if you go to the contacts page you can view the contacts listed by tag, there is also a select box called “Current Filter” You can change the filter to view photos and other assorted info from those tagged users. 3) You can display your raw tags datastore. You can get all my other scripts here along with all my other greasemonkey scripts for flickr.